Frameless systems are a very popular choice of balustrade system and they are suitable for domestic and light commercial applications. Where a frameless system is to be installed the base rail is securely fixed to the base structure and the toughened glass panes clamped within it. Alternatively the glass panes may be face fixed to the supporting structure. Glass clamps are used to connect the glass panes together and the system may be fitted with or without a handrail and, where a handrail is required, there is a wide choice available in various types of profile section; circular, square, steel or timber. 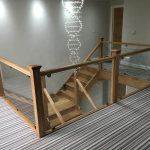 The balustrade systems are available in a wide range of options including timber and glass, steel and glass, with or without handrail, frameless, face fixed, floor fixed and many others, a range so wide that all your desired requirements can be provided. There is also the popular, and extremely versatile, post and glass infill type of balustrade available and it is suitable for both the domestic and commercial application. The balusters posts are available in square or circular profiles, both which are readily available. Acorn Glass and Glazing have a technical team that are able to provide you with the advice and recommendations you may need to achieve your desired outcome and includes the ability to make bespoke items for unusual locations, shapes and sizes. An important feature of any glass balustrade is that it meets the standards set down by the Building Regulations and Acorn Glass ensure that their balustrades always meet these requirements as well as being made to British Safety Standards and providing certification of the design calculations. Our design calculations include an assessment of the location where the balustrade is intended to be installed followed by an evaluation of the anticipated wind loadings, snow loadings, impact loadings to which it is likely to encounter and an appropriate system and, fixing methods recommended. 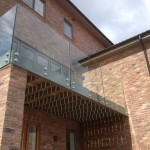 Thinking of installing a glass balustrade? Acorn Glass are specialists in structural glass installations and one of our specialisms is the design, manufacture and installation of glass balustrades. 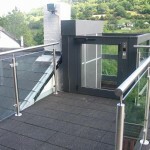 Glass balustrades can be used in a wide variety of situations, both internally and externally, such as balconies, stairways, atriums, patios and terraces, and provide a light, appealing and secure enclosure.